Whether you liked the Dark knight movies or not (a little too much mumbling behind masks sometimes I thought) like me you must have been pretty much taken with the cool car called the Tumbler and the Bat Pod that was made from it – like a massive motorcycle with fat tyres that could go sideways – all it needed was a scantily clad lady to be draped on it – hang on it happened? It was Catwoman? And it WASN’T Halle Berry? COOL! 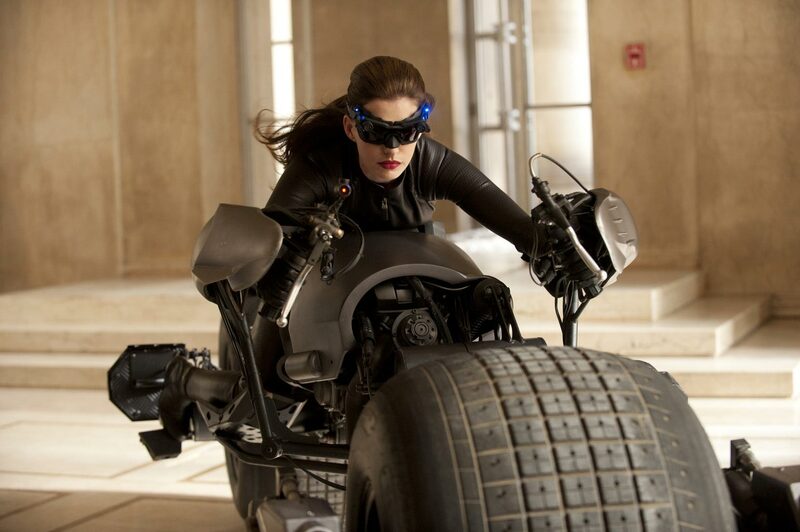 We loved the Badpod with the new Catwoman on it – but what is this – there is a MODEL of it? What better excuse to get making models hey? This model kit comes from those purveyors of Sci-Fi, fantasy and Monster model makers Moebius in the states. It isn’t that dear for a large 1/18th scale kit – a little larger than their initial batman and Batpod kit in 1/25 – and of a better quality – this kit comes in a cool box complete with three small sprues of injection moulded plastic, two fat nylon tyres and a figure in cream resin. First the sprues – three quite small sprues with fewer than thirty parts make this a simple build – but a build that must be pretty sharp as any seams left unsanded will be seen due to the nature of the exposed chassis of the bike. Lucky there aren’t that many seams to sand and the lines of the kit make it look pretty clean when completed. The resin figure is very nice indeed. Not too smelly which is sometimes a put off for modellers – this figure comes in six parts and is a really simple construction – the parts simply fit together in slotted holes provided by Moebius – this is really nice engineering – and with flash free resin with no bubbles this is another great plus to the kit. Tyres tyres – well either love them or hate them vinyl tyres are here – these fall onto the good side of that relationship because they simply slip over the large hubs they are meant to fit onto and are free from that excess horrible rubber that often comes with tyres like these. Indeed they would be much more a hassle if they were resin material for example. The wheels aren’t weighted but I cannot remember these to be in the movie either as they are such a low profile. We thought we would get the wheels sorted first – this is a major part of the build but relatively simple at the same time – the large vinyl tires slip on easily and can be taken off so you can paint the wheels later if you wish. The handles where it meets the figure were a little bit of a tricky match but a bit of push and pull sorted them out. The axle goes through each tyre and allows the wheels to spin if you like - though I wouldn’t give it to someone’s kid to play with once it is finished! The chassis fits together rather all too easily – and although it is a little confusing at some parts nothing a modeller of moderate skills cannot manage – the main body of the bike is put together within an hour – the actual build time on this bike and figure was just over two hours from start to finish. You could spend a lot longer painting and detailing this bike – the one that Catwoman rode in the last batman film had silver sides on the handlebar guards and some parts of the bike. Though it could be painted up any way you like – what a about a “What if?” scheme – pink or digital camo? Now you have me thinking about it I am thinking lots of different schemes. Now where is my pink paint?? ?